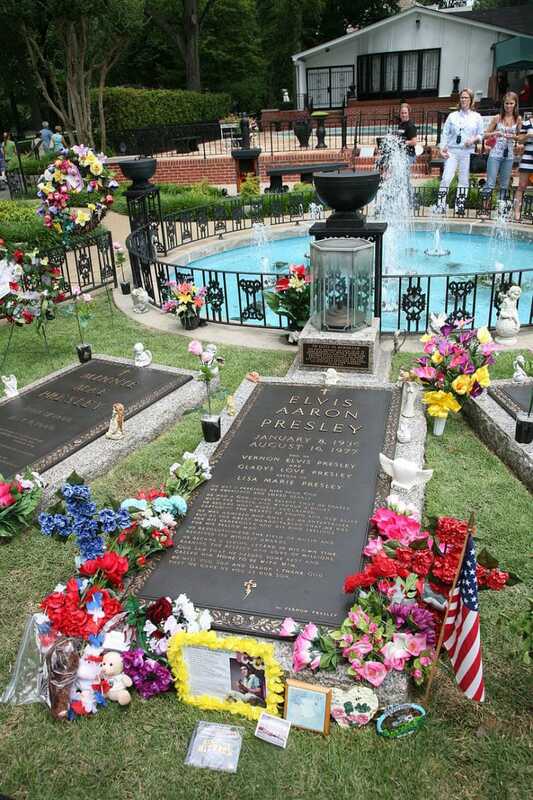 Today we honor the King of Rock and Roll, Elvis Aaron Presley, on the anniversary of his death (August 16, 1977). What better way to celebrate the legacy of Elvis than by exploring the foods he enjoyed while he was alive? I’m always curious about the food that legends like Elvis grew up eating. Learning about it makes me feel like I know a private part of them, the part that makes them human… the part we can all relate to. Elvis was the King, but he was also a normal person who enjoyed eating, just like the rest of us. Boy, did he ever enjoy eating! 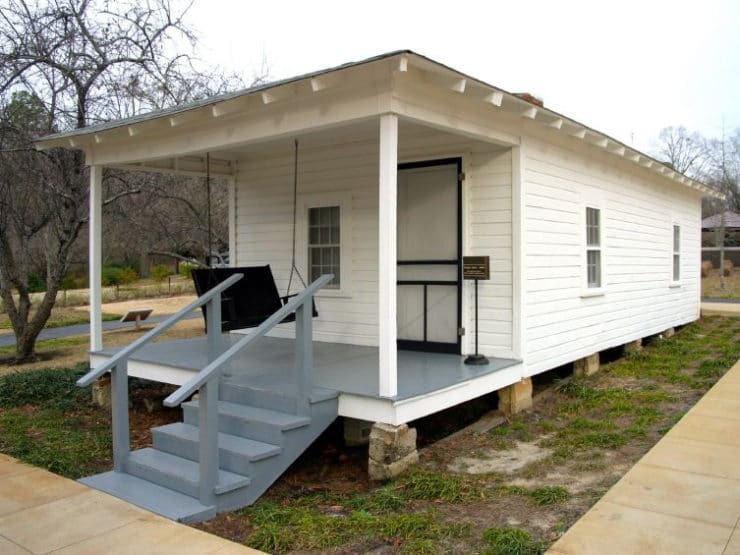 Elvis was born on January 8, 1935 in a two room house in Tupelo, Mississippi. He had a twin brother Jessie who was stillborn, but no other siblings. 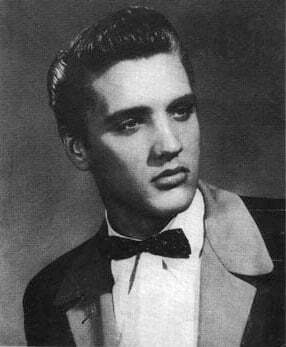 In 1948 his parents moved to Memphis, Tennessee, where Elvis would spend most of his life. Elvis grew up listening to gospel music, country, and early Southern R & B. He began singing for Sun Records in 1954, then for RCA in 1955. By 1956 he’d become an international recording star. His sound was edgy for the time, and it ushered in a new era of American music. He became known as the King of Rock and Roll. But really, he was just a Southern boy at heart. Rich, heavy, caloric foods… Elvis was known for having a very “kingly” appetite. Not healthy by any stretch of the imagination, but many of the foods he enjoyed were very, very tasty. Some of his favorite dishes included baked apple and sweet potato pudding, blackberry pie, breaded chicken livers, ham bone dumplings, potato cheese soup, banana pudding, and of course those infamous butter-fried peanut butter and banana sandwiches. When planning this blog, I got a copy of the cookbook “Fit for a King” by Elizabeth McKeon. Recipes in this book were supposedly sourced from Elvis’ longtime cook at Graceland, Alvena Roy. I thought it would be fun to try an authentically Southern dish in honor of Elvis. A recipe for “Sour Milk Cornbread” caught my eye. “Sour milk” is unpasteurized (raw) milk that has gone slightly sour. Raw sour milk is generally fine to cook with, but if it’s pasteurized forget it… sour pasteurized milk has turned bad, and can make you really sick. Since most of us drink pasteurized milk nowadays, buttermilk is a safe substitute that gives you the same flavor as sour milk without the danger of foodborne illness. I gave the “Fit for a King” Sour Milk Cornbread recipe a try… oh boy, was it awful! I have a hard time believing that the bread was ever served to Elvis. It was certainly not “Fit for a King”… in fact, it’s barely fit for the squirrels in our back yard! This is not a cake-style cornbread (translation– fluffy and very sweet), so if that’s what you’re used to, you might be surprised by the heavier/denser feeling of this cornbread. My family enjoyed its hardy texture and rich buttermilk flavor. Cooking it in the skillet gives it a wonderful brown crust. Personally, I like a little sweetness in my cornbread, but some people do not. If you prefer an unsweetened cornbread, feel free to leave the honey/sugar out… it won’t change the texture, and you can always sweeten it with honey to taste after it’s baked. The buttermilk adds a slight tang that plays really nicely with the cornmeal. It’s so simple to make, and can be whipped up on a moment’s notice. It would go great with a big bowl of chili or soup, or as a hardy accompaniment to a summer salad. While this bread is generally made with bacon grease, it can easily be made kosher by substituting vegetable oil or butter. Preheat your oven to 400 degrees F. Place your seasoned cast iron skillet on your stovetop and set burner to medium high. Let the skillet heat up for about 10 minutes while you prepare the cornbread batter. 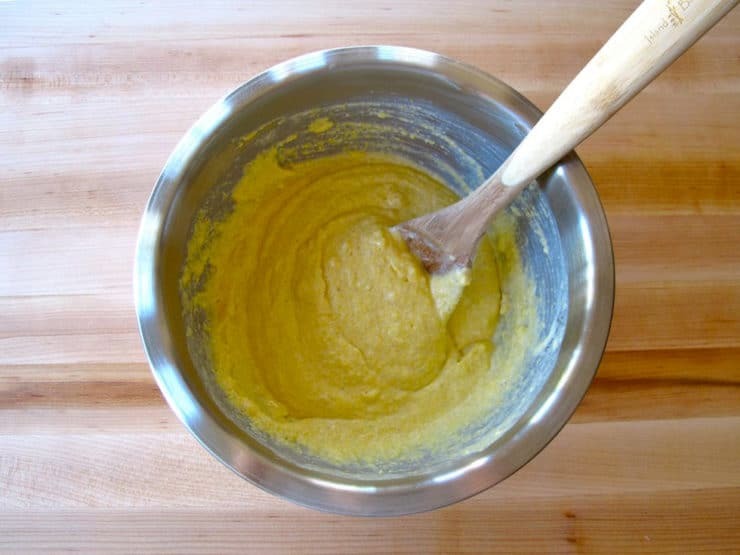 In a large mixing bowl, stir together cornmeal, flour, baking powder and salt till thoroughly blended. 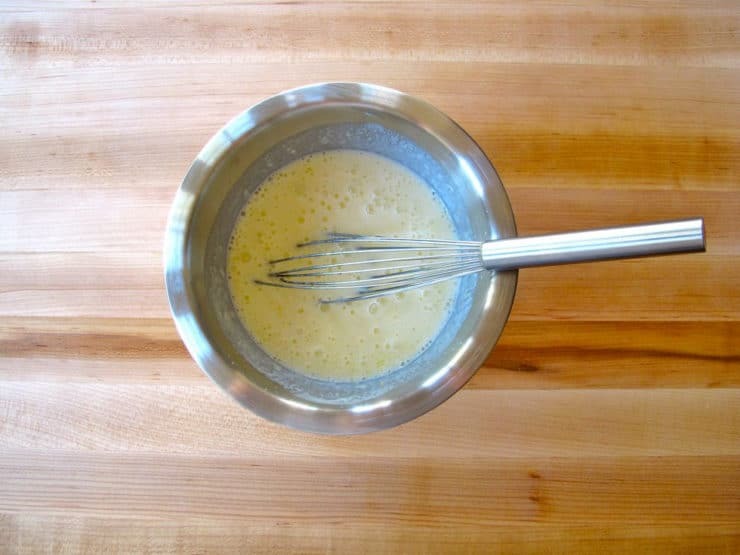 In a smaller bowl, whisk together buttermilk, eggs, melted butter, and honey or sugar (optional). 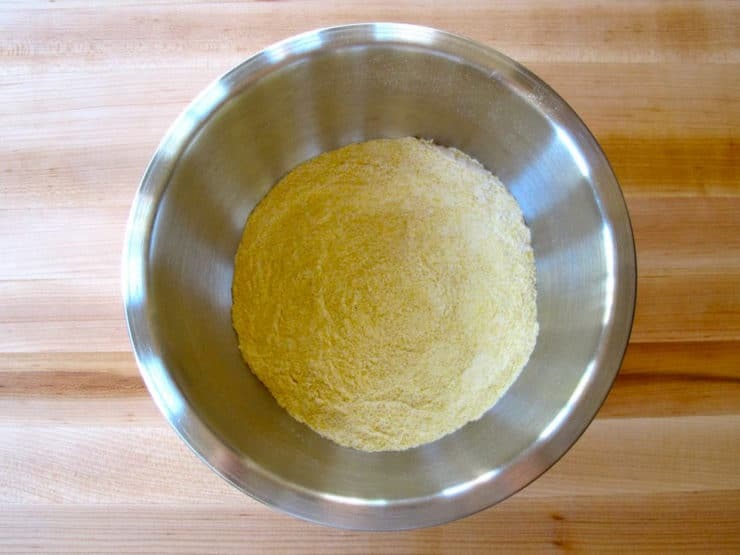 Stir wet ingredients into dry until the cornmeal mixture is just moistened. Don't overmix-- a few lumps are okay. 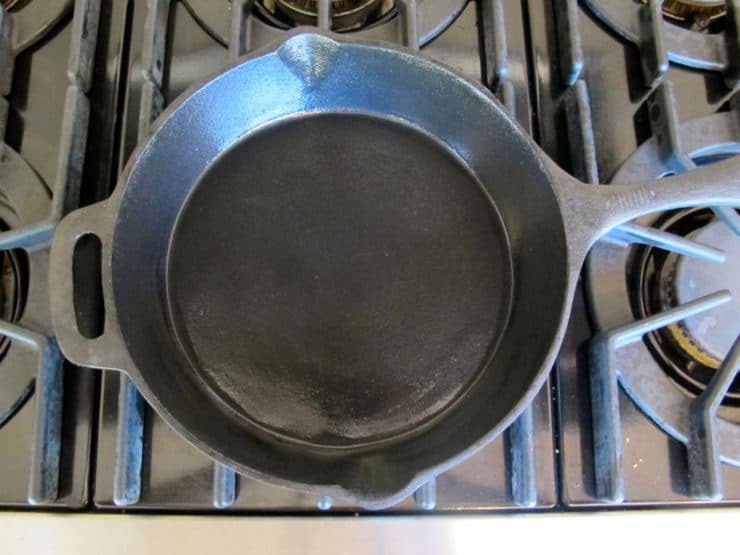 Grease your hot skillet with bacon grease or vegetable oil with a high smoke point, like peanut oil (careful, don't burn your fingers!). Pour your cornbread batter into the hot skillet-- it should sizzle a bit. Use an oven mitt to pick up the skillet. Place the skillet immediately into the hot oven. Let the bread bake for 20-25 minutes till the edges brown and pull away from the pan. Test for doneness by sticking a toothpick in the center of the bread. If it comes out clean, the bread is ready. Take the bread out of the oven and let the skillet cool a bit. Bread can be cut and served about 10 minutes after taking it out of the oven-- just be careful, the skillet will still be hot. The skillet will keep the bread warm for up to 30 minutes. Kosher Modification: substitute vegetable oil for bacon grease. Thanks Rylie! I haven’t tried his “signature” version, but I do regularly enjoy peanut butter and banana sandwiches. Next time I’ll throw one on the grill in honor of the King! Tori: I have read a number of cornbread recipes on the Internet, and most of the recipes calling for buttermilk include the addition of baking soda; those that call for milk, use baking powder as a leavening agent. Would like your opinion on this. Thanks so much. Great website! Loved the tribute to the King’s cornbread. Origanally from 5 generations of Tennesee. We had cornbread nearly every day on our table as did all my relatives. My mother always said no self-respecting hillbillie would use anything but white cornmeal, never put egg or sugar in cornbread, and it is never served in the skillet. Cornbread is turned onto a plate like a cake and served that way. I do use an egg and a little sweet’nin in my cornbread, but not if my mother is here to visit. I prefer honey – but sugar is ok, but since I started keeping bees have developed the taste for the honey. Love that you have started keeping bees… I have thought about doing that myself! The Southern cornbread I’m used to doesn’t use flour, and the real flavor in the crust comes from melted hot bacon grease. I also like the batter griddled into pancakes, a great base for barbeque (more likely to find this in Middle Tennessee barbeque places, though, than anywhere els). I love this site! I’ve put it in my favorites. This is lovely, and of course Elvis was far from fat when he was growing up extremely poor (endemic obesity among the poor came later, with the growing availability of cheap starches, fats and modified sugars). Like the great futebol star Diego Maradona, for someone who was always hungry as a kid, wealth meant rich food. I’d tend to add a wee bit of honey, but just a tbsp full. I also like cornbread with a bit of fresh chiles, but that is Southwesten, not Southeastern. My skillet was made by Findlay stove co., near Ottawa, and is probably older than I am. And I’m old enough to be your mum. Wonderful recipes! Here are two variations that I use to make cornbread with a good crispy crust. First, add a little water, about an ounce to the batter. Second, put the oil ( I use canola) in the cold skillet before you heat it. When the skillet is really hot and the oil is almost smoking (after about 10–15 minutes), quickly pour in the batter. To help keep the corn bread from sticking, sprinkle a couple of large pinches of cornmeal in the sizzling oil just before adding the batter. If your cornbread sticks, it is because you did not get the oil sufficiently hot before adding the batter. I had no idea when I met you at blogher that your blog was this amazing. I’m very impressed. Heather does nice design too. Thanks for the company. It was lovely to meet you. ps. I love skillet cornbread. It’s my favorite way to make it. I LOVE cornbread in a cast iron skillet. This recipe sounds wonderful! Oh my goodness,this sounds terrific! 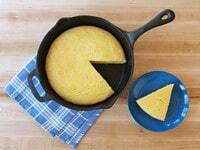 I LOVE cornbread and am definitely keeping this recipe bookmarked. Delightfully appropriate, Tori, since Elvis was — believe it or not — halachically Jewish (uninterrupted maternal line documented). It was his decision to include a Magen David on his mother’s tombstone, in honor of their heritage. That’s fascinating Anita! I knew he wore the Magen David towards the end of his life, but I didn’t know it was to honor his heritage. How cool is that?? This looks similar to our favorite cornbread recipe. Love it with the buttermilk. What a great post – I loved the list of must-haves, especially those that were required to be made fresh daily. I need a cook. LOL. This type of recipe for cornbread is my goto recipe when I’m making chili or soup or green chile stew. The skillet makes it more rustick in texture, it isn’t dainty, but it IS delicious! I use the ‘turning lemonjuice in milk into buttermilk’ technique quite often since I never have it in the fridge when I need it. It works great! Cornbread looks so light and perfect! Do you know what this recipe needs? A recipe for chili! LOL I might just have to make this tomorrow for dinner. Nicely done, lady. I love his songs and he was pretty big in Turkey as well. I just got myself a cast iron to be a proper Southern girl, I need to use it now 🙂 Thanks for the recipe! My problem is that I don’t really know how to successfully “season” a cast iron skillet. I always end up with everything sticking to it! Any suggestions?? Thanks. Candy, that is an excellent question! I will do a post on how to season a skillet in the next few days, I’ll post the link here when it’s up. It’s a simple process, but you’ll need to set aside a few hours for it. Thanks for the Elvis information, Tori! I did not know he had a twin brother. To the King! I was wondering, what would you recommend for a baking instrument if we do not have a seasoned skillet, or even a skillet at all? Hey Hester, no worries… you can bake the bread in an 8×8 square baking pan. You can preheat it for 10 minutes in the oven instead of on the stovetop. Lightly grease it before adding the batter. This was such a rocking post Tori. I love that you did this. The fact that you put the pantry list in here blows my mind. My folks loved Elvis. I have some stuff of his I inherited actually. So enjoyed this post tremendously. Great recipe. I love that it looks so inviting. You just want to grab a slice through the screen. Okay so query for you. I want to invest in a cast iron pan, I don’t have any. I know it’s sad right?! I am on a budget so will probably only pick up one for now. What size do you think is the most useful and versatile? Any suggestions for me? Fabulous! 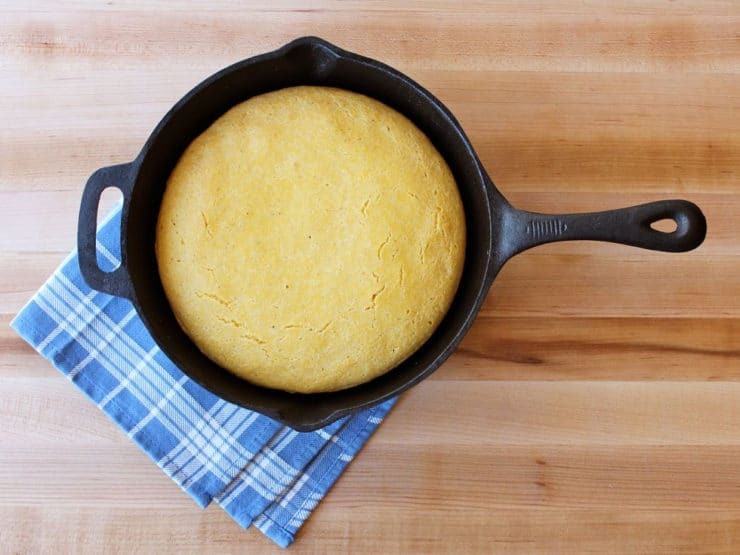 One of my favorite ways to make corn bread is in a HOT cast-iron skillet. The crust it makes is too delicious for words! bless you my oven is on the blink and i have been craving cornbread. i’m making it tomorrow. also i shared another recipe of yours on facebook. it was a real hit. 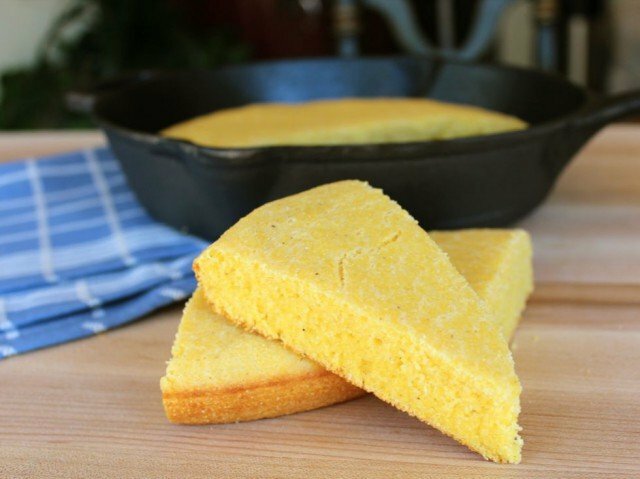 This recipe looks delicious and I make all my cornbread in an iron skillet. 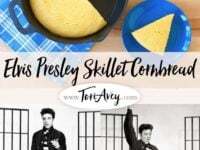 I also grease my skillet in the oven with bacon fat for added flavor and I bet Elvis would have enjoyed that too, but I’m not sure it is appropriate for the Shiksa kitchen…:) Thank you for honoring Elvis with this recipe!! Put fat or oil in a cast iron skillet and place in oven. Preheat to 400F–this allows the fat or oil to heat as well as the pan. Mix dry ingredients; add egg and milk and stir with a spoon or spatula until mostly smooth; remove skillet from oven; swirl to coat; pour hot oil or melted fat into batter and stir. Pour batter into hot skillet and bake at 400F for 30-25 minutes. If your pan was well seasoning you should be able to turn this out onto a plate or board. NEVER cut it in the pan–a cast iron skillet will last for generations if you are good to it and using a knife in it is not nice. 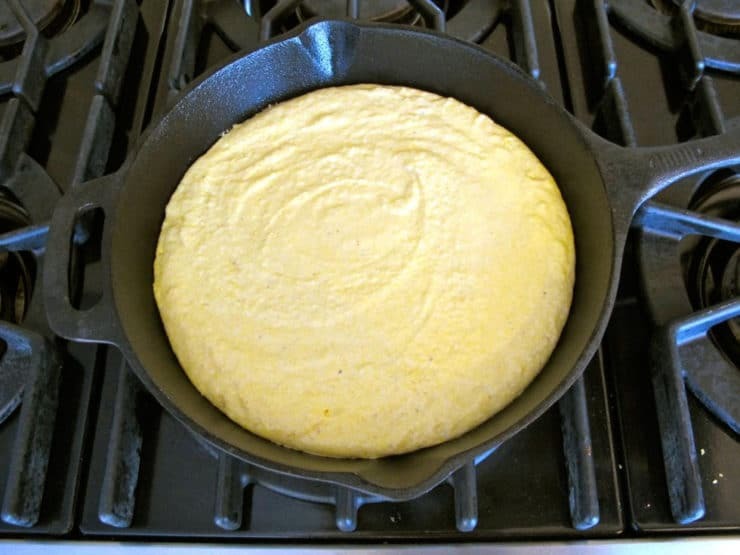 If the middle pulls off and clings to the skillet, carefully remove it with a thin metal spatula and replace it on top of cornbread–no one will care. If you want something sweet eat this with honey or jam or other sweets–honey is best–but do not sweeten the batter. Put left-overs in a zip bag crumble, press out the air, and add more as you have it. This will come in handy for stuffing at Thanksgiving. Or eat the left overs with honey or jam and/or butter for breakfast. Cornbread is also good crumbled into a bowl of beans–for a kosher recipe for southern style pinto beans email me at pal482@yahoo.com. Normally made with ham or bacon or fatback or such the beans can be made with a special kosher ingredient! Yellow cornbread or cornbread with 1/4 cup of sugar or honey is called “Yankee Cornbread”–probably not something Elvis would have eaten. At a Marie Callendar’s restaurant in L.A. I once had the funniest, sweetest, yellowest, un-crustiest “cornbread” ever! Thanks for posting…gosh I remember when Elvis passed…time flies. I really like the way this was written. I just watched a documentary on Elvis today too. I do like my by cornbread a little on the sweet side. The texture of the bread looks good too. 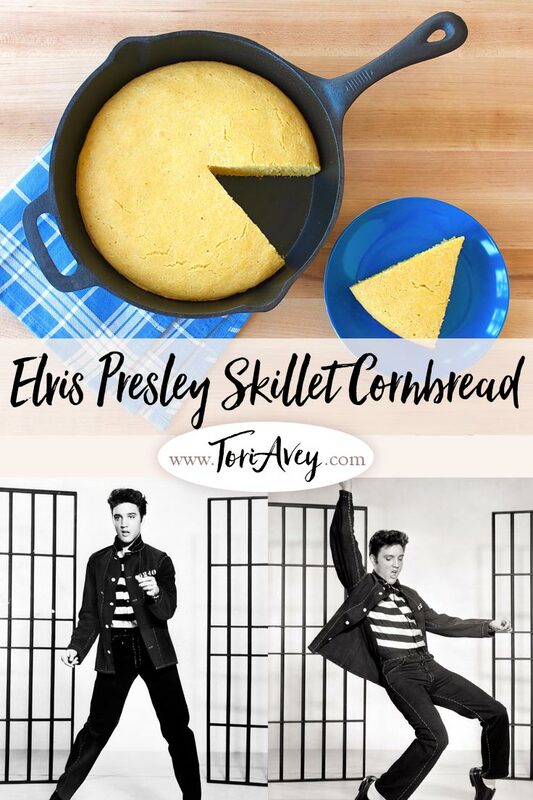 Thanks for sharing a little Elvis nostalgia and a great recipe!